Craftsmanship is something that experience has taught me; there's little room for "quick and dirty", as we need to focus on delivering the best work we can in the timeline the audience grants us. I'm entirely convinced this industry needs more of this approach. with more powerful results. History has proven this observation to be on point. an emotional impact for the audience. Do you need a resume? If so, please feel free to download my CV. Applied Arts Award - Interactive. Hellmann’s Eat Real, Eat Local. Davey Awards - Silver. AXE, M.I.N.D.I. Jason is a talented Creative, delivering fresh ideas that are on strategy and on budget. During our time together working on the Wrigley Canada business, Jason delivered breakthrough creative on the launch of Excel Extreme leading to +75 Brand Awareness 6 months post launch. The work was also recognized by his peers, receiving an award from the Advertising & Design Club of Canada. Jason is a very sharp guy. He's very collaborative, and a great problem solver in all the ways that you'd want to get through a digital project. Hard working creative guys like Jason are hard to find. Jason brings his ideas to life with great attention to detail, precision, integrity and a strong sense of design. He truly is one of the best art directors out there not only in terms of his work but his interest in executing his ideas through constantly evolving social media applications. Jason is the best. He always has a strategic, on-brand solution for any problem and is a true outside-the-box thinker. His creative mind is not only impressive, but inspiring. I loved working with him on every project we touched, for he is both an excellent collaborator and an intelligent mentor. Everybody basks in the glow of his positive office presence - colleagues and clients alike. Not only is Jason a fantastic designer and creative mastermind, but a great leader and an exceptionally thorough one at that. Quite honestly, I learned more at Dashboard than any other agency in the last several years and Jason certainly contributed to helping me become better at my own craft. Jason is a highly creative, passionate, and intelligent individual. Having worked with him for over a year, he showed a deep respect for the creative process and a keen awareness (and curiosity) of the on-goings in his field. As an Art Director, he always thought through each project very critically and quality of the end result was evident of his thoughtful considerations and talent. As a colleague, Jason was just a generally awesome guy and always brought the laughs with him. I hope to work with him again, as I am certain there is much I can still learn from him! Jason is a gifted creative. His design work is super strong -his ideation skills are top notch. He can visualize and manifest beautiful work. Jason has an extremely strong work ethic and is hands on throughout the creative process. He asks for the best from himself, from his work and his teams and he gets it. Jason is a one of the top creative people I have worked with in the last year. When he thinks no one is looking you can catch Jason admiring and exploring the lines, curves and overall design of whatever subject is on set as he is constantly evolving his thought process with respect to the assignment at hand. As a director, Jason always encourages a collaborative work environment and knows when he has got the best from his suppliers. Daniel Banko worked with Jason (ACD, Dashboard, Senior Art Director, Creative Lead at henderson bas kohn and Digital Creative Director at BMIR) as Photographer. Working with Jason was an experience that I am lucky to have had. His direction and guidance not only helped shape my career as a creative person but many of those who he has worked with. Jason is a creative force, from the big idea and strategic thinking down to execution; he is there every step of the way showing passion and enthusiasm while guiding a project to completion. He always pushed the boundaries of himself and his team during the process to create something truly excellent that we could all take pride in being a part of. A creative powerhouse on all levels and amazing attention to detail Jason always helped take my work to another level, it was truly a pleasure to have worked with him. Jason was a fantastic ACD to work with. Very grounded and was always thinking about the next steps. He brought very insightful and constructive feedback to the team while still managing to inspire everyone. I would highly recommend him. Jason is a high-energy, talented and results-oriented Art Director. He produces outstanding work that not only stands apart creatively, but achieves business results. That, and he's a great team player. His friendly demeanor and passion for great work make him a pleasure to work with. Jason is an extremely talented conceptual designer, but it doesn't stop there; he engages right from the start to build the creative branding strategy and seeing it through to conception. His years of experience come shining through in his ability to effortlessly mentor and lead a team of designers and nurture the brand of any client he works with. He would be a valuable asset to any creative team. I would definitely work with Jason again. I look forward to any project that Jason is associated with that I'm also lucky enough to be a part of. That's because there is no doubt that the creative and strategy will be awesome. He consistently cranks out great creative at a brisk pace, and has been doing so since before I first met him about 8 years ago. He "gets" online, and keeps up with it as it evolves probably better than anyone else I know. It has been both an honour and a pleasure to work with Jason the over the course of the past year. From big picture ideation to pixel specific design details he brings his A-game to whatever he is tasked with. Working with Jason on numerous projects for the AXE brand was a fantastic experience - he's a true creative thinker that brought Award-winning technical, design, and social ideas to life seamlessly, while remaining an incredibly accessible and flexible partner throughout the process. Jason rocks! As a freelance illustrator you get to work with a variety of creative people in your career. It's a blessing when you can connect with a director who creates an energetic environment that inspires. Jason is one of these fine folks. I constantly look forward to future collaborations with him and the challenges he brings me. He's a pleasure to work with and a damn funny guy to boot. Jason is one of those art directors who always pushes the client, the technology and the team to do more. He lives and breathes the brand, putting him well ahead of the curve when it comes to delivering thought provoking, strategic and insightful creative. I've put my trust in Jason for some very high profile, demanding campaigns and he delivered beautifully executed work that the client loved and also resonated with the intended audience. As a senior account director at hbk, I interacted daily with Jason on a wide range of projects for multiple clients. To this day, he remains one of my favorite colleagues and I hold a great respect for his talent as a senior art director. He’s your ideal creative lead. He’s not only exceptionally smart and confident when it comes to dealing with and presenting to clients but he’s able to see the entire picture of what the client objectives are and where we can do something new and outside the box creatively. He has exceptional knowledge of digital technology and is always willing to help our clients understand every aspect of a campaign we’re pitching. His creative and technical knowledge helped to increase both respect and trust in our agency’s abilities. We had the pleasure to collaborate with Jason over at Dashboard..
His keen eye and artistic sensibility were an instant fit. We look forward to working with him again,.. hopefully very soon! Jason is one of those rare individuals that can see both the big picture and those tiny, invisible details. Due to his expressive nature he relishes passion, energy, and enthusiasm in every project. Talent is written all over Jason's work and every single project he has touched has been a success. It has been a pleasure and an honor to work with him. In my time at Due North Communications I had the pleasure of working with Jason on several projects; the most notable of which was the work we did together for H&R Block’s first digital campaign. Jason’s creativity and passion helped us take a simple idea - a Facebook application to estimate tax refunds – and create a full-blown life simulator that let young adults play with virtual cash on Facebook. Jason’s enthusiasm and leadership were integral in delivering a great final product – and phenomenal results! Jason Is a uniquely creative and highly dedicated individual. Over the last several years we have worked together on many cutting edge projects both interactive and traditional. This guy can think outside the box. I am proud of every project I did with Jason and his team and would not hesitate to work with him again. I have had the pleasure of working with Jason on various Nestle projects. His passion for digital is infectious and he is willing to take on any project, regardless of complexity. He saw a static banner campaign as a personal challenge to hone his skills by simplifying his creative, and not relying on "bells & whistles". At other times, he has invested his own time to develop modules in Flash, to ensure the client fully understood the creative vision. Jason is a welcome addition to my team any day! It was a pleasure working with Jason. He is a great leader with an amazing ability to encourage, motivate and bring the best out of everyone he works with. I'd work with him again in a heart beat. It was a pleasure working with the all mighty Chesebrough. His passion and integrity for whatever project both small and large always expressed truth, insight and kickassness. He is a strong mentor and I learned several valuable lessons from him. It was an honor. Jason is a great leader, a great creative mind, a loyal employee and someone I am proud to work with. 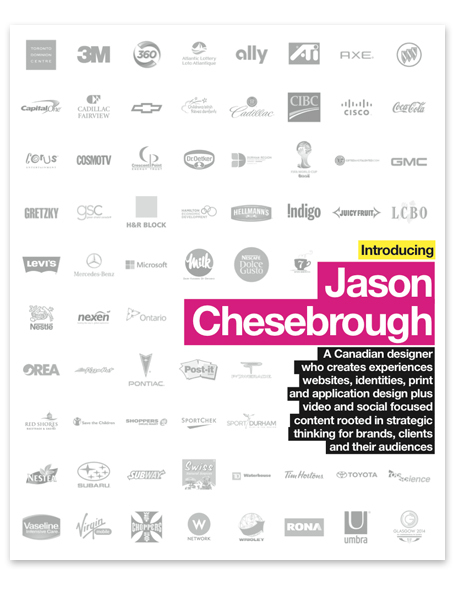 Jason worked on various design projects for the Mercedes-Benz and smart Canada websites and he surpassed expectations every time. He always presented highly creative and idea driven solutions while staying true to each brand’s attributes. He collaborates very effectively with his clients and is a pleasure to work with.